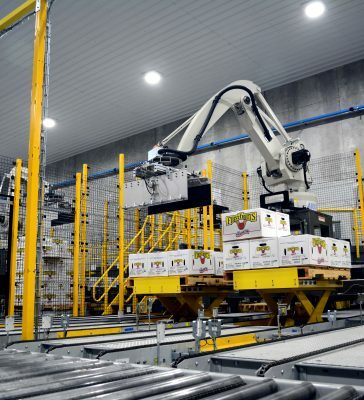 A robotic palletizer is only as good as the software running it! Columbia/Okura has one of the most intuitive and easy to use programs in the industry. Designed specifically for the palletizer, OXPA automatically produces standard product patterns that are quick and easy to change, minimizing downtime while giving users the ability to accommodate different retailer’s needs. Custom patterns and pallets are also easy to create with our software. Even a novice will find it easy to create a new design thanks to the do-it-yourself computer program. The software will look at the possible configurations based on product dimensions input into the system. Each robotic palletizer is equipped with detailed graphics, simple navigation tools, and complete system integration services. Additionally, Columbia/Okura technical staff are always happy to take services calls for questions about creating patterns for your product needs. And, before delivering any robot, we assist in working out the best designs for your current product and ensure these run smoothly.